Cardinal Giuseppe Versaldi, Prefect of the Congregation for Catholic Education, Gran Chancellor of the Pontifical Gregorian University, was born on 30 July 1943 at Villarboit, Vercelli, Italy. In 1976 he returned to Vercelli and was charged to set up a diocesan family counselling centre, of which he was director, and promoted the family apostolate. Subsequently he became president of the Piedmontese Federation of Christian Counsellors. In 1977 he became a parish priest of Larizzate, an outlying district of Vercelli. In 1980 he was invited to teach canon law and psychology at the Pontifical Gregorian University, while retaining some of his activities in the Archdiocese of Vercelli. He obtained the title of advocate at the Roman Rota and then became a referendary in 1985, a voter in 1990 and finally a member in 2007 of the Supreme Tribunal of the Apostolic Signatura, while also teaching anthropology at the Studium of the Roman Rota. On 25 March 1994 he was appointed vicar general of the Archdiocese of Vercelli. On 4 April 2007 he was appointed Bishop of Alessandria and received episcopal ordination on 26 May 2007. 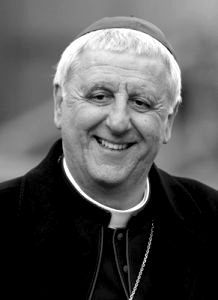 On 21 September 2011 he was named President of the Prefecture for the Economic Affairs of the Holy See and elevated to the dignity of Archbishop. On 31 March 2015 he was appointed Prefect of the Congregation for Catholic Education. Created and proclaimed Cardinal by Benedict XVI in the consistory of 18 February 2012, of the Deaconry of Sacro Cuore di Gesù a Castro Pretorio (Sacred Heart of Jesus at Castro Pretorio).